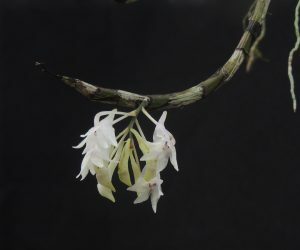 This is a small growing Dendrobium species native to Java where it grows in cool wet forests from 1600-2100m altitude. 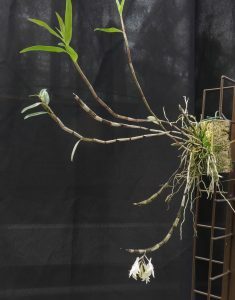 The name refers to the star like flowers – if you look from underneath – and these are produced from old leafless pseudobulbs making a plant that will become better and better with time as it matures. This is its first flowering at Writhlington and it does seem rather charming. We are really pleased that the public will have a chance to see it at the Bristol University Botanic Gardens, Bee and Pollination Festival this weekend. The flowers of the species are characteristic for bird pollination and in its native Java this would be honeyeaters. We grow the species mounted and water throughout the year.